Product Sample: A complimentary collection was provided to me in exchange for this styling and review. Affiliate Links: If you click on a link in this post, I may make a very small commission. Happy Friday! I can’t be the only one who’s felt like this week just dragged on and on, right? This weekend isn’t going to be that exciting, but my goal is to get our home office all set up… which also includes my brand new makeup vanity and storage. Insert squeal here. I’ve been dying for space to “get ready” forever and am so glad it’s almost reality! Speaking of brand new… You guys know my love for clothing “subscription” services already, so when I received an email from Emerald Cuff, I couldn’t wait to check it out. They’re a brand new, local, Seattle-based operation, and the brainchild of 3 moms who wanted to create something for busy women – be it a career gal, a fellow mom, or a #girlboss. Unlike other clothing services (compared to say Stitch Fix or DailyLook Elite Box), Emerald Cuff releases new collections every month that you can choose from. This is not an automatic charge, and you do not need to opt out. Every month, they curate collections with one fashion “hero” item, one piece of jewelry, and one fashion basic. Unfortunately the item in the collection from this month I liked was sold out in my size, so instead I curated my own collection. I picked one fashion item from their boutique, one jewelry item, and then they included a fashion basic that went with my selections. The cost for most collections is $75, or if you’re not interested in a full collection, items can be purchased individually via the boutique. Right now select past pieces are also on sale. What impressed me about their items first upon receiving them was the packaging. It was seriously adorable. Everything was packaged individually in kraft paper or boxes, stamped with their brand name. The items themselves all feel high quality. 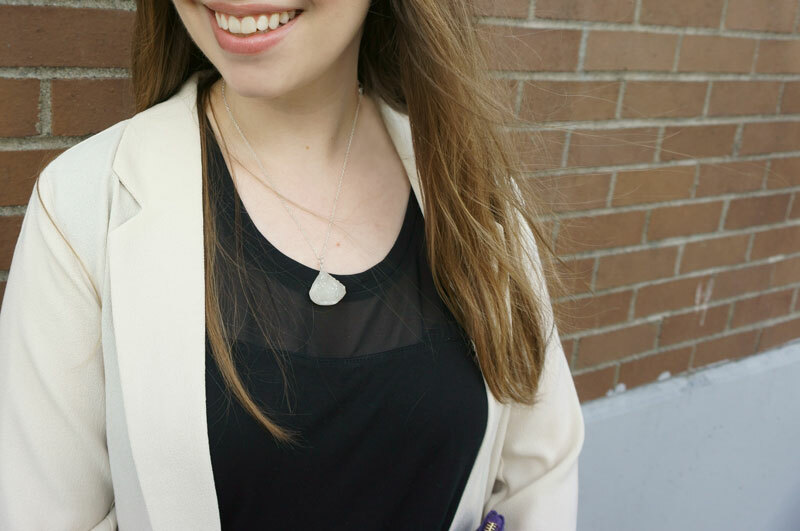 This blazer by Ellison feels like a luxurious crepe material, and the necklace from Cutie Gems is substantial. The druzy pendant is weighty while the chain feels sturdy yet appears delicate. The Ambiance Apparel top is nice and soft and feels like it will withstand washing and drying like a champ. If you’re interested in checking Emerald Cuff out, they’ve generously offered 15% off through the end of July with code EMERALD at checkout. (Not an affiliate code.) Alternatively, you can also sign up with my referral link that will give us both $10 off our next purchase. Have you heard about Emerald Cuff? Which collection or pieces are you a fan of? Or tell me about your weekend plans… I’d love to hear what you’re going to be up to! I am totally all over that look. I think I’m going to be sporting something similar all fall long. 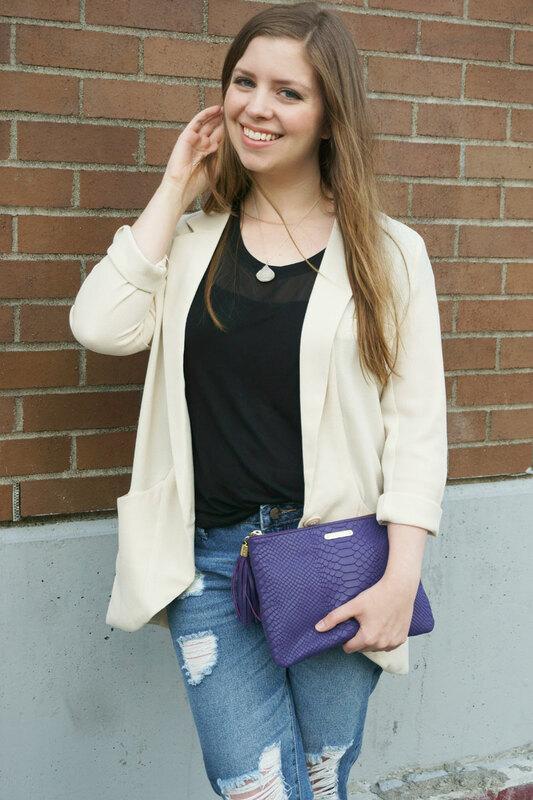 LOVE the blazer; it is so flattering on you! I love the concept of Emerald Cuff and I LOVE this look. I’ve never head of them but I’m totally going to check them out! My week has totally dragged on too! Love that blazer, so pretty! That’s a neat concept, I had never heard of Emerald Cuff before! very cute! 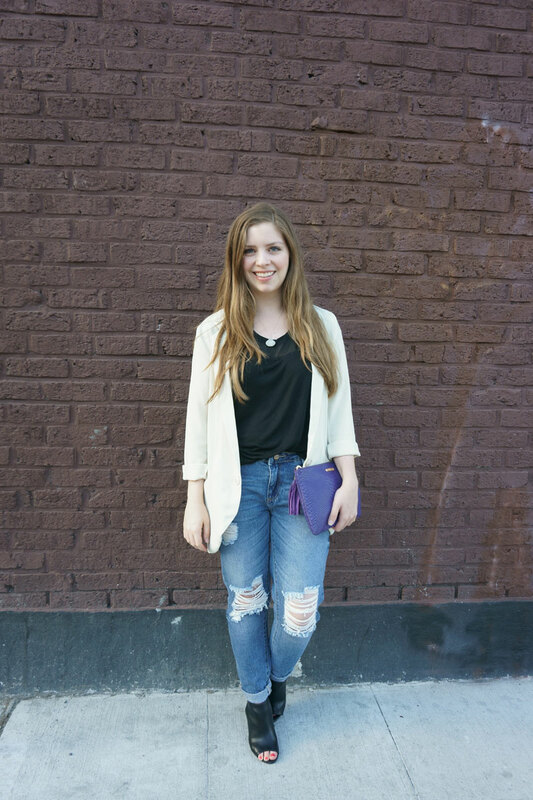 I’m all about the tattered denim and pairing blazers with casual wear! love! Thanks! Def going to check this out!! 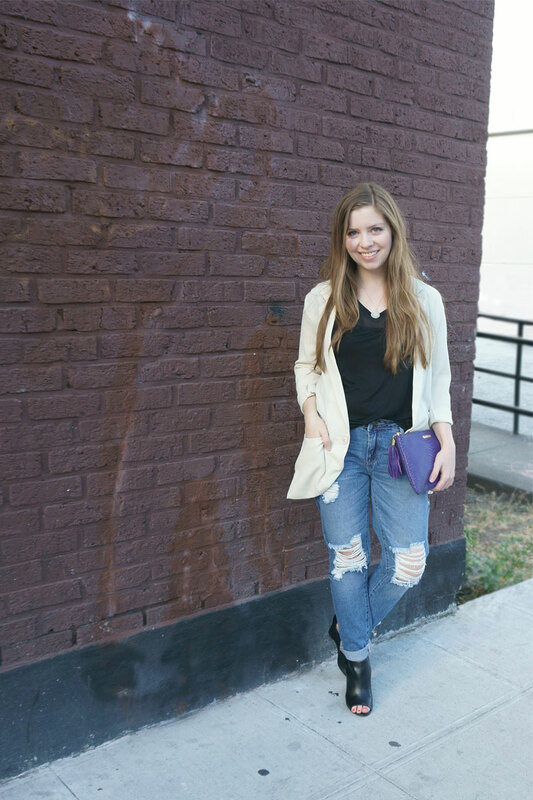 I love Stitch Fix but this seems much more reasonable! Awesome, glad you like it, Lindsay! love the entire look!! The clutch is so cute!